In a nutshell, here's an idea I'm playing with: I would like to spice up Vicksburg's (Michigan) boring election season by creating a fictious character running for a fictious office. 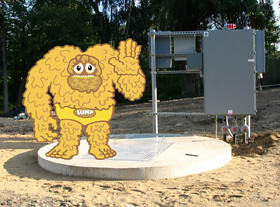 Given that my inner child seems to be a disturbed seventh grader, a position involving sewage seemed like a natural idea. So I illustrated a character named "SUMP" and created a fictious office title. 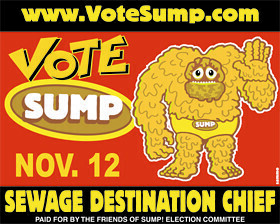 SUMP would then be promoted via election yard signs, a micro website describing the candidate's positions (in an absurd way), circulation of a few flyers and lastly a huge cardboard cut out placed in various locations around town (to pique people's interest). That's it. That's the concept. Just a fun little experiment I'm thinking about trying. Admittedly, it's definitely an idea that's a bit "out there". 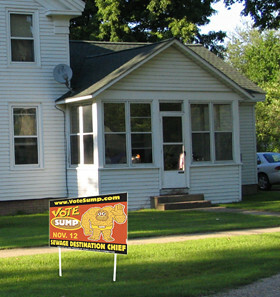 Really I don't have a goal in mind other than it'd be fun to see SUMP election yard signs next to legitimate candidates signage. Granted micro web sites and flyers might be overkill but, It may be fun to help people ESCAPE the ordinary. it's too funny - i'm going through the IF posts and click on your link - and when i read the post, i think, "hm. i wonder, is this the guy who left that illo on the door of someone's business?" and you ARE! your stuff makes me laugh. if you go through with this, you'll probably be driving down the street and hear some deejay go on and on about those 'sump' signs. keep us posted. I'm thinkin bumper stickers are a deffinate must. You've got my attention. Stickers of any kind are a must. Every election should have a certain amount of weirdness, no? I will check back to see how this one is going. I'd vote-just because! yeah you've gotta do it. for so many reasons though I think Vicksburg lacks a sense of humor. God you seem out of place there--do you feel that way? Can't wait until election night! I figure if I like an idea there will be others who appreciate it too (regardless of location). So far the few things I've done have been favorably received. Not sure how this concept will fly overall but, I think the idea will have some ardent supporters. As far as fitting in with the community. Doing these public art pieces is my way of being involved in the community without REALLY being involved in the community.